E3 saw the announcement of Devil May Cry 5, which apparently is bringing the insouciant Nero and aging heavy metal star Dante together for another round of acrobatic demon slaying. A few new screenshots provide a sharper look at the glimpse we got in the E3 trailer. It’s clear from the trailer that Nero suffers the loss of his demonic right arm at some point in the game. That’s no bad thing, though, as it appears he replaces it with a socket that can accept various prosthetics, which we imagine you’ll upgrade throughout the game with the help of Southern-fried craftswoman Nico, who rocks a sweet pair of boots and drives a classic van. Not everyone is as good as Nero at facing demons. Check out our list of the best horror games on PC. This being a Devil May Cry title, the action is centered mainly on fighting demons, and we’ve got a couple shots of this as well. One shows Nero casually sitting atop an overturned vehicle, firing a pistol into some twisted zombie-insect hybrid, and another shows him slashing into one of a group of enemies that look like the Grim hanging out at a train station. Finally, there’s a lovely shot of Dante rolling up on a bat-themed motorcycle, which he may have purchased from Gotham City. Here are the shots, courtesy of Twitter user @shinobi602, who is always great about posting these things. 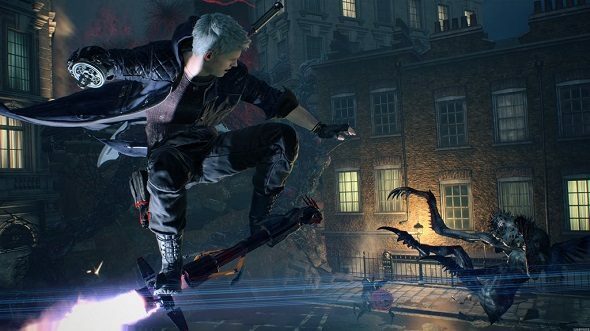 We’ve theorized that Devil May Cry 5’s setting may be a London-style city – or even London itself – but there’s no confirmation on story details as yet. But another demon-slicing romp with Dante and Nero certainly sounds like fun. Devil May Cry 5 is due out next spring.